Also serving communities of Minden. There are 12 Assisted Living Facilities in the Bossier City area, with 4 in Bossier City and 8 nearby. The average cost of assisted living in Bossier City is $2,906 per month. This is lower than the national median of $3,346. Cheaper nearby regions include Shreveport with an average starting cost of $2,265. To help you with your search, browse the 109 reviews below for assisted living facilities in Bossier City. On average, consumers rate assisted living in Bossier City 4.2 out of 5 stars. Caring.com has helped 8 families in Bossier City find high-quality senior care. To speak with one of our Family Advisors about assisted living options and costs in Bossier City, call (855) 863-8283. Bossier City, which has more than 68,000 residents, is a sister city to Shreveport. The area is best known as the home of Barksdale Air Force Base, the region's largest employer. Seniors make up 12.3 percent of the population in Bossier and may eventually desire living in a community of peers where assistance with daily tasks is available 24 hours a day. There are 12 assisted living facilities (ALFs) in the greater Bossier City area, all of which are regulated by the Louisiana Department of Health. The air quality in the Shreveport-Bossier City area is considered to be good. It receives an overall "B" rating from the National Lung Association for ozone pollution days and an "A" rating for particulate pollution, making the city a good place to live for seniors with respiratory conditions like COPD and asthma. The Bossier City, Louisiana area is home to world-class medical facilities, including Wills-Knighton Bossier Health Center, in the event of medical emergencies or illness. Bossier City, located on the northern border of Louisiana, along the Red River, has what is classified as a hot sub-tropical climate. The hallmarks of this type of climate are hot, steamy summers, rainy springs and mild winters. The average high temperature in January is 57 degrees Fahrenheit, and the average high temperature in July is 93 degrees Fahrenheit. The high humidity can be uncomfortable to some older people. Crime is a big problem in Bossier City, as it is in many other cities in Louisiana. The crime rate in Bossier City has increased by 8 percent in recent years, making it 93 percent higher than the national average. Just 5 percent of U.S. cities are safer than Bossier City. SporTran operates public bus lines within Bossier City and Shreveport. They offer reduced fares to seniors age 65 and older who have a reduced fare card. In addition, the Bossier Council on Aging offers on-demand non-emergency transportation for seniors (age 60 and older), with advance reservations. Bossier City, Louisiana offers a number of cultural opportunities. The city is home to the Louisiana Boardwalk shopping district, the Sci-Port Discovery Center and the CenturyLink Performing Arts Center. Assisted Living costs in Bossier City start around $2,906 per month on average, while the nationwide average cost of assisted living is $4,000 per month, according to the latest figures from Genworth’s Cost of Care Survey. It’s important to note that assisted living rates in Bossier City and the surrounding suburbs can vary widely based on factors such as location, the level of care needed, apartment size and the types of amenities offered at each community. Eligible seniors Bossier City, Louisiana seniors can find a number of state and federal assistance programs to help with the cost of an assisted living facility. 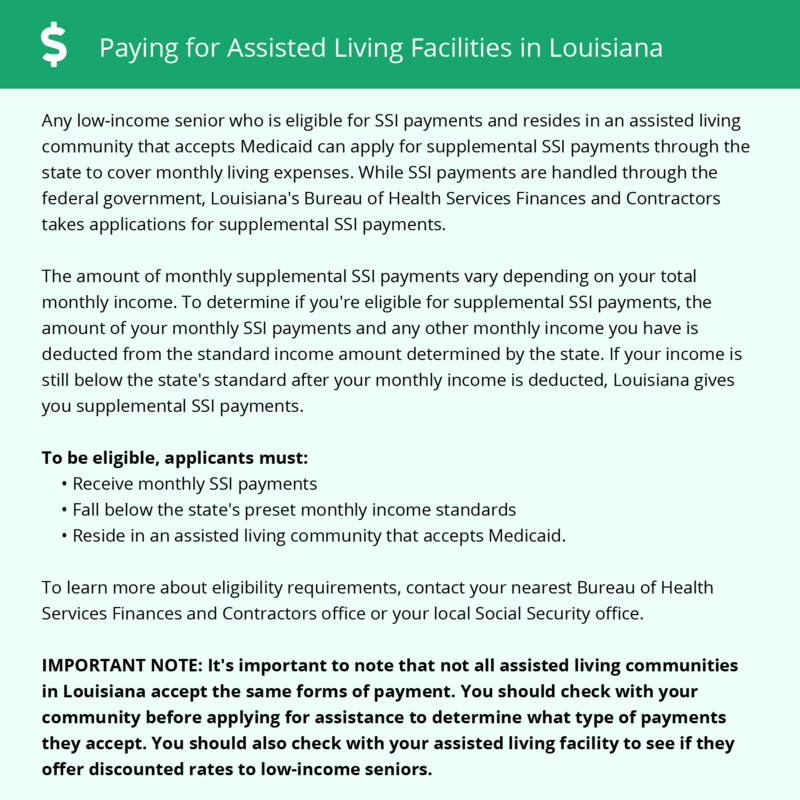 These include the Community Choices Waiver (CCW) and Supplemental Security Income Category G.
Learn more about these programs, plus who’s eligible, on our Assisted Living in Louisiana page. For more information about different ways to finance assisted living, visit our Assisted Living in Louisiana page. Bossier City and the surrounding area are home to numerous government agencies and non-profit organizations offering help for seniors searching for or currently residing in an assisted living community. These organizations can also provide assistance in a number of other eldercare services such as geriatric care management, elder law advice, estate planning, finding home care and health and wellness programs. To see a list of free assisted living resources in Bossier City, please visit our Assisted Living in Louisiana page. Bossier City-area assisted living communities must adhere to the comprehensive set of state laws and regulations that all assisted living communities in Louisiana are required to follow. Visit our Assisted Living in Louisiana page for more information about these laws.